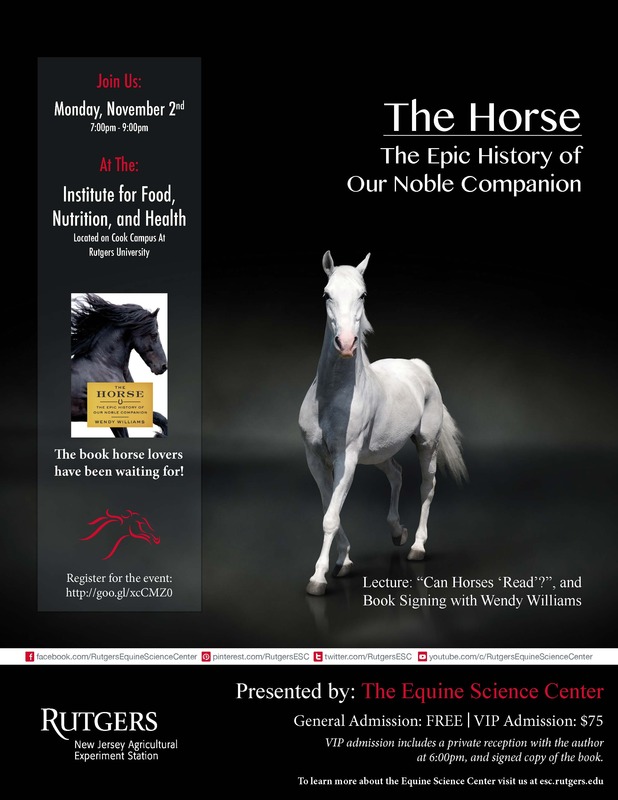 NEW BRUNSWICK, NJ– The Equine Science Center is proud to partner with veteran science journalist Wendy Williams in hosting the premier book signing event and lecture by Ms. Williams on Monday, November 2, 2015 on the G. H. Cook campus. In Williams’s revealing and groundbreaking new book about the 56-million-year story of the horse, we come to understand the science behind how horses think and act, the evolutionary forces that shaped them, what their story tells us about changes in our climate over the years, and how the horse-human partnership evolved. “Williams compiles research from scientists and horse experts from all over the world in this magnificent book” said Karyn Malinowski, Director of the Equine Science Center. “Her lecture preceding the book signing titled, ‘Can Horses Read?’ is sure to be a hit with Rutgers University students and equine enthusiasts. Williams will take us through her through her scientific travelogue and provide images from her travels where she studied horses in places where they still roam; such as Mongolia and Galicia, and to sites with prehistoric art and fossils in France, the Basque country, Wyoming, Germany, and even Los Angeles”, she added. The story of the horse’s evolution, from the small deer-like four-toed Eohippus into the imposing, breathtaking one-toed Equus we know and love today, cannot be told without featuring the story of the changing world, complete with moving continents and tectonic shifts, drastic habitat reversals and vanishing vegetation, climate changes, and near-extinction. The lecture and book signing will be held at the new Institute for Food, Nutrition, and Health building on the G. H. Cook Campus. Beginning at 7:00 PM, admission will be free for the general public. A VIP reception with the author, will start at 6:00PM in the same location and include an advanced copy of the book (available everywhere on October 27). Tickets will be $75.00 a person.